Separated from the girl he loves and has sworn to protect, Froi and his companions travel through Charyn searching for Quintana and building an army that will secure her unborn child’s right to rule. While in the valley between two kingdoms, Quintana of Charyn and Isaboe of Lumatere come face-to-face in a showdown that will result in heartbreak for one and power for the other. The complex tangle of bloodlines, politics, and love introduced in Finnikin of the Rock and Froi of the Exiles coalesce into an engrossing climax in this final volume. This series is over. MY BODY IS NOT READY. I just want to live forever with these characters. Is that wrong? Sometimes reading is a painful hobby. I get so close to and so emotionally tied to the happiness of fictional characters, but then their books end and I emerge, blinking and lonely, into the real world. They leave me slightly changed, but are none the different for my love of them. Quintana of Charyn did not quite surpass Froi of the Exiles for me, but it is still an immensely satisfying read that I will surely revisit someday. As ever, Melina Marchetta excels at world building. The whole of this world is so real to me, and I have such an understanding of their prejudices and customs. Those are, I think, what Marchetta does to really make the communities seem so real. There are always the stereotypes of whatever group, and they have their truth, but underneath there’s so much more. For example, the Lumaterans are a much more physically affectionate culture. Happy occasions are shared with the whole of the community, like the scene with the proposal at the end of Finnikin of the Rock and another, similar scene in Quintana of Charyn. Of course, even within the Lumaterans, the people of the Rock aren’t quite like those of the Mont, and, oh, Marchetta does this all beautifully. In Quintana of Charyn, Marchetta really delves into the political situation in Charyn. With the death of the king, Charyn was thrown into chaos as various factions attempted to take control. The whole country is on the verge of a massive civil war. Neighboring Lumatere fears that such a war could overflow into their borders, especially since they already have a tense relationship with the Charynite exiles living in the Lumateran valley between the two countries. Political sounds boring, but it’s not because battles and relationships in jeopardy. For me, though, it’s all about the characters. They’re so beloved of me, this whole large cast of flawed, beautiful, grumpy people. Watching them find love and acceptance, move past the curses of their people, has meant so much. To speak to why I love each one of them would make this review of a length utterly unacceptable, so let me just hug them all in my head and proclaim that I would read as many books about these people as I could. Though I loved this one nearly as much as Froi of the Exiles, I do have two issues with Quintana of Charyn. The first is a reiteration of my reason for not finding Froi of the Exiles quite perfect. Marchetta has created well-drawn, lovable characters, but I think her own love for them has kept her from making the book as dark as it would need to be for perfection. Everything wraps up a bit too conveniently. The other issue is a change to the writing style in Quintana of Charyn. Where the rest of the series was entirely in roving third person limited, Marchetta makes the odd choice of adding in first person for Quintana. While Quintana’s narration is hauntingly beautiful, written in a sort of savage poetry, I do not understand this decision. Perhaps if Quintana has ALWAYS been in first, but to add this, and for so few sections, in the final book in the series, makes absolutely no sense to me, and was really unsettling as a reader. Quintana of Charyn is a solid conclusion to the Lumatere Chronicles, even if it does leave me wanting more because Marchetta probably couldn’t write enough about these characters for me to tire of them. The final installment will not leave fans disappointed. 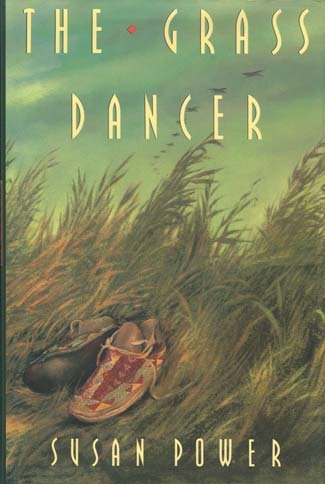 The next Sadie Hawkins Sunday book will be The Grass Dancer by Susan Power, which was recommended by Ann Kristin. It was…an experience. Come back later to find out what kind of experience. Once you mentioned that there is a happy occasion in Quintana I just know I’m going to be bawling at the end haha. Disappointing that Marchetta doesn’t do anything dark, I know if she could, she would definitely excel at making her fans all crumple to their knees as they got facepunched by the feels. I was hoping for the last book to be a lot darker seeing as the political situation in Charyn is unstable and with Lumatere afraid it’ll affect them as well. Interesting about the writing, I guess maybe since Quintana has always been a bit different from the rest, it made more sense to write from her perspective so we could understand more about her? I can see why it would be unsettling, I guess I’ll just have to see for myself and see how I find it. I am still not ready for this series to be over and its been months since I’ve finished Quintana. Erm. Anyway. Your review made me want to pop out Finnikin again, especially –> “Those are, I think, what Marchetta does to really make the communities seem so real.” I don’t remember all the differences between the Monts and the Rocks and the Rivers and whatnot, but they’re there, and I love how she compares the different groups. “For me, though, it’s all about the characters. They’re so beloved of me, this whole large cast of flawed, beautiful, grumpy people.” < -- Agreed. This is like the perfect confection of character-driven fantasy. There wasn't a whole lot of action in Finnikin, but I did love all the characters. “I think her own love for them has kept her from making the book as dark as it would need to be for perfection” < -- Interesting... I'm looking forward to seeing whether I think the same of both Froi and Quintaya. Not enthusiastic about the first person narration switch (does that have anything to do with Quintaya’s multiple personalities? okay, okay, so maybe while waiting for her book to arrive, I’ve been skimming Froi…. ).